Since its foundation, the Southern District of Texas has been served by forty-one District Judges and six Clerks of Court. The first federal judge in Texas was John C. Watrous, who was appointed on May 26, 1846, and had previously served as Attorney General of the Republic of Texas. He was assigned to hold court in Galveston, at the time, the largest city in the state. As seat of the Texas Judicial District, the Galveston court had jurisdiction over the whole state. On February 21, 1857, the state was divided into two districts, Eastern and Western, with Judge Watrous continuing in the Eastern district. Judge Watrous and Judge Thomas H. DuVal, of the Western District of Texas, left the state on the secession of Texas from the Union, the only two United States Judges not to resign their posts in states that seceded. When Texas was restored to the Union, Watrous and DuVal resumed their duties and served until 1870. Judge Amos Morrill served in the Eastern District of Texas from 1872 to 1884. He was succeeded by Chauncy B. Sabin (1884 to 1890) and David E. Bryant (1890 to 1902). In 1902, when the Southern District was created by Act of Congress, Judge Bryant continued to serve in the Eastern District of Texas. In 1917 the General Services Administration added courtrooms and judicial offices to the second floor of the 1861 U.S. Customs House in Galveston, and it became the new federal courthouse for the Southern District of Texas. This location would later become the seat of the Galveston Division, after Congress added a second judgeship in the 1930s. In 2007 criminal charges were filed against Judge Samuel B. Kent, the only District judge in the Galveston Division, who sat at the Federal Courthouse in Galveston, the oldest federal judgeship in the state. Due to the litigation, Chief Judge Hayden Head transferred Kent and his staff to the Houston Division. Judge Kent subsequently pleaded guilty, in February 2009, to obstruction of justice and, after being impeached by the House of Representatives, resigned in June 2009. The next month, it was announced that Judge Kent's post would remain vacant for the time being, and a replacement judge would be assigned to McAllen, due to the increase in cases in the Texas border area concerning subjects such as drugs and immigration. Laredo, Texas, is located on the northern bank of the Rio Grande River and is unique in its ability to operate international bridges between two Mexican states. The city presently maintains four border crossings and one rail bridge with the Mexican State of Tamaulipas at Nuevo Laredo and the Mexican State of Nuevo León at Colombia. Webb County also borders the State of Nuevo León and the State of Coahuila, Mexico, northwest of Laredo. Laredo is the largest inland port along the U.S.-Mexico border and the Pan American Highway leading into Mexico through Laredo stretches from Canada and continues into Central and South America. Because of its location and accessibility to Mexico, Laredo’s economy is primarily based on international trade with Mexico. According to the Laredo Development Foundation, more than 700 of the Fortune 1,000 companies do international business via Laredo and more than 9,000 trucks cross through town per day along with 1,800 loaded rail cars. Laredo is ranked first in growth in Texas and seventh in the country by the Milken Institute. 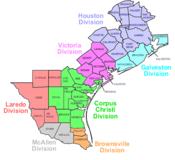 The division encompasses five counties with the federal courthouse located in Laredo, Texas. There are two Laredo district court judges - Judges Diana Saldaña and Marina Garcia Marmolejo, who presided over more than 2,000 felony cases in 2013 - most of which involved charges of narcotics trafficking and alien smuggling. In addition, there are three federal magistrates who alternate duties every two weeks. Additionally, the federal grand jury convenes every other week where AUSAs rotate the responsibility of presenting felony cases. ^ a b "Laredo". United States Department of Justice. Retrieved October 11, 2016.